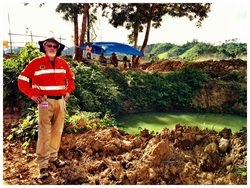 Ken Hayes next to a bomb crater from a Viet Nam Era explosion. When Aqua Survey President Ken Hayes asked me to go to Laos with him to help find a solution to the threat that legacy UXO from the Vietnam Era pose to Lao people in their day to day lives, I said yes. The leg wall at the Cope Center. Every Year hundreds of people are hurt or killed in Laos by bombs left over from a war that ended 40 years ago. The Lao Government and some NGO's are doing their best to find and clear the bombs and munitions that still cover the countryside, but the going is slow, costly, and dangerous. Can we bring new technology to the field to speed up the process? because every week that goes by means more innocent people, most often children, are injured by leftover bombs forgotten by the rest of the world. 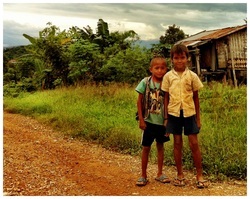 We made a movie about our work in Laos. And submitted it to film festivals too. The rough cuts are here in you tube, in three parts. Thanks to Garrett Hayes and Andrew Froening. We also became passionate about helping the victims of UXO by donating money to make prosthetic limbs and provide assistance and education, through the COPE Center. 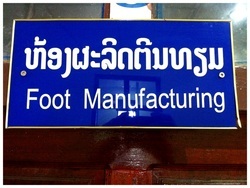 They can build a prosthetic leg for about $75 US. Arms, physical therapy, and other services are also provided. 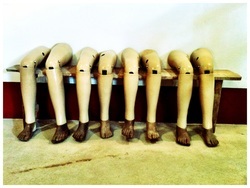 If you want to help us reach our goal of raising enough money for 1000 legs, Let us know.